Finally, fed up with all the rallies of Narendra Modi, his fan following and criticisms against him, Bihar Chief Minister Nitish Kumar threatened BJP that don't consider Modi as a Chief Minister of Gujarat or he will leave NDA. The development came after Narendra Modi taunted Kumar that nobody complains when political parties use Osama bin Laden look-a-likes during Bihar election campaigns, but have problems if he takes out a rally. "How can he say this statement to a proud Bihari like me? He can't taunt me on the secular front. 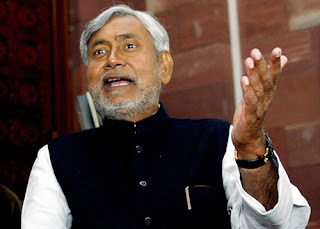 I am a true follower of the secularism, though not as much as Congress do and therefore with NDA otherwise just being Modi in the party I would have left that time only," said Nitish Kumar. He said "Now forget the post of Prime Minister, I don't want Gujarati janta to get this communal leader again on their heads. Though, I am with NDA now I follow Keshubhai Patel's principles strictly and ask NDA to put another candidate on the CM's post or I would leave the NDA right now."